Taylor Swift, Ashley Graham And More Attend Gigi Hadid's Star-Studded 24th Birthday Party - OK! "Blank Space" is a song by American singer-songwriter Taylor Swift from her fifth studio album 1989 . It was written by Swift, Max Martin and Shellback. The song was released to the radio by Republic Records on November 10, 2014 as the album's second single, after "Shake It Off" and is the second track on the album. 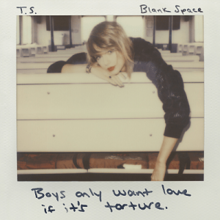 Musically, "Blank Space" is an electropop song with lyrics that satirize the media's perception of Swift and her relationships.